This is where you can get information about books featured on The Early Show in August that don't have their own, separate stories. Life is full of letdowns and disappointments. 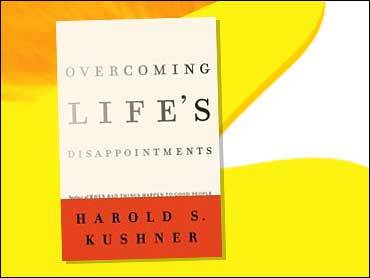 Probably best-known for his book, "When Bad Things Happen to Good People," Rabbi Harold Kushner has been writing about the bad moments in life for many years, and teaching us how to deal with them. His latest advice comes in his new book, "Overcoming Life's Disappointments." On The Early Show, he discussed why we seem to be more disappointed than ever, why he chose to use the life as Moses as a framework to understand disappointment, and some common disappointments and ways to reframe them in our lives. Finally, Rabbi Kushner looked at letting go of anger as a way to have a happy life. To read an excerpt of "Overcoming Life's Disappointments,", click here. If you haven't been able to connect with your perfect man, it may be because you're not thinking right. The way to a man's heart may be through his brain! That's what E! News anchor Giuliana DePandi believes. She offers 66 dating tips for women in her new book, "Think Like a Guy: How to Get a Guy By Thinking Like One." To see the segment, click here. To read excerpts, click here. Traer Scott is a photographer by trade, an animal lover by hobby. It was through her work as a volunteer at a local Rhode Island shelter that she began to combine her two passions. The fruits of that labor take form in a soon-to-be published book, "Shelter Dogs." "Shelter Dogs" is a collection of portraits taken by Scott of dogs from various animal shelters. Many of the dogs featured have already been adopted, though sadly some have been euthanized. Scott's goal in this project was to capture each dog's beauty and personality and to bring awareness to the problem of millions of animals that die in shelters. The author discusses the book on The Saturday Early Show. To visit the author's Web site, click here. When you walk down the aisle, do you have to leave your friends behind? Marriage can put a barrier between you and your friends, but there are ways to prevent it. Sociologist Jan Yager discussed them on The Early Show. Yager, an expert on friendships, wrote "When Friendship Hurts." Memory trouble is one of the first signs of aging. That's why so many of us talk about "having a senior moment" when we forget something. But you can do exercises to improve your memory. Dr. Gary Small, director of the UCLA Center on Aging, stopped by The Early Show to talk about them. To watch the segment, click here. He's the author of a new book, "The Longevity Bible." To read an excerpt,click here. The phrase "girl power" used to send a message to little girls: They could be anything they wanted to. Now, it's more of a commercial slogan than anything else, according to authors Sharon Lamb and Lyn Mikel Brown, who say marketers are targeting girls, pitching products that are supposed to empower them. Lamb and Brown address the issue in their new book, "Packaging Girlhood: Rescuing Our Daughters from Marketers' Schemes." They discussed it with co-anchor Rene Syler on The Early Show.